Jacques Copeau was born on February 4th, 1879 in Paris. He had a brief career as an art dealer, but between 1904 to 1906 worked as drama critic for the periodical L'Ermitage. From 1907-10 he wrote the same sort of material for La Grande Revue, but it was also during this period (1909) that he was co-founder with André Gide, Jean Schlumberger and Paul Claudel of La Nouvelle Revue française. He edited this new journal until 1911 becoming well known as a literary critic. Copeau was interested in the work of André Antoine who founded the Theatre Libre for the production of the new naturalistic plays by Ibsen and Strindberg. However he was very much against the realist theatre, and antagonistic to the 'well-made play' of Eugène Scribe and his followers. He railed against 'frenzied commercialism' and spectacle for its own sake. In the autumn of 1913 he opened his own theatre near the Place Saint Sulpice on the Left Bank, and named it after its location at 21, Rue du Vieux Colombier. 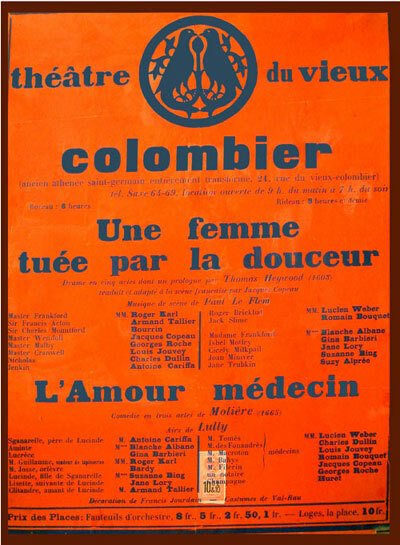 The Théâtre du Vieux-Colombier, according to Copeau was 'the brain-child of a group of artists whose ideological understanding and collective practical inclination ... brought them under the same banner'. Copeau acted as actor, director, playwright and translator using the actors Louis Jouvet, Charles Dullin and later Valentine Tessier and Suzanne Bing. His first productions were an adaptation of Thomas Heywood's 'A Woman Killed by Kindness', in which he appeared as Wendoll, and 'L'Amour Médicin'. Feeling that the most important aspects of a drama were the text and the actors who he trained himself, he preferred stagings without elaborate sets, the 'tréteau nu' or the bare moveable stage of touring companies. Copeau's most important productions were plays by Molière, like 'Les Fourberies de Scapin' and translations of Shakespeare plays. 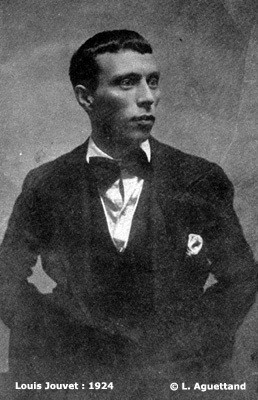 He had been a great admirer of Granville-Barker's 'Twelfth Night', and produced his own French version, 'La Nuit des Rois' in 1914, with Louis Jouvet as Andrew Aguecheek. However he also brought to the public's attention a number of young dramatists, e.g. the French religious dramatist Henri Ghéon. His 'Le Pauvre sous L'escalier' was produced by Copeau in 1913. During the First World War Jacques Copeau was forced to suspend performances in Paris and took his company to New York. Here at the Garrick Theatre on West 35th Street he produced more than forty plays until 1919. At this time he was concentrating more and more on the training of his young actors, although as part of France's propaganda programme in the war he still appeared on the stage. In 1920 he went back to Paris and resumed his work at the Vieux-Colombier, where he struck up a friendship with the poet and dramatist Jules Romains. His 'Comedeyre-le-Viel' was produced in 1920. In the autumn of 1924 at the age of 45 Copeau announced his retirement from the Parisian stage and took a young company of 30 actors, the 'Copiaus', off to Pernand-Verglasses in Burgundy, where he founded a theatre school. The emphasis in the dramatic training there was on movement and music, including eurhythmics as taught by the Swiss composer and educationist, Emile Jaques-Dalcroze. The careers of the actors Jean Dasté, Aman Maistre and Etienne Decroux began as a result of this ecole. In 1926 the Copiaus toured in Switzerland, in particular in Basel where they performed 'L'Illusion'. Some of the company later became members of the 'Compagnie des Quinze' directed by Michel Saint-Denis, Copeau's former stage-manager and assistant producer at the Vieux-Colombier, who had gone with him to Pernand. In 1936 Copeau returned to Paris having been appointed as one of the producers at the Comedie Francaise, despite being warned against it by Edward Gordon Craig. (Harley Granville-Barker on the contrary encouraged Copeau to accept). He retired for a second time in 1941, dying 8 years later in 1949 at the age of 70. Copeau's daughter Marie-Hélène, herself a stage and screen actress, married Jean Dasté. In 1972, together with Copeau's niece and former secretary, Suzanne Maistre Saint-Denis she founded the Association des Amis de Jacques Copeau, in Paris. Their (successful) aim was to try to publish Copeau's collected writings the Registres (Gallimard). In 1986 Marie-Hélène retired to Copeau's old home in Pernand-Vergelesses. Copeau's library was catalogued for the benefit of theatre researchers under the auspices of the French ministry of Culture, and the house was declared a national landmark. Madame Dasté herself died in 1994. Jean Dasté Daste was a big influence on Jacques Lecoq - the famous French teacher, who himself trained Steven Berkoff, Julie Taymore and the members of Theatre de Complicite amongst many others. John Rudlin now teaches courses run by Selavy and is following Copeau's model in working in rural conditions.